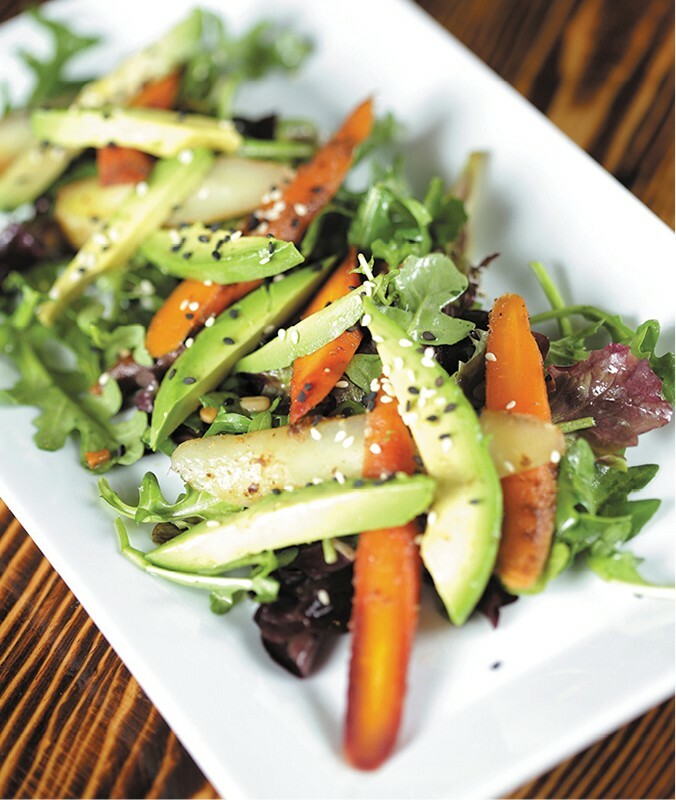 If a roasted heirloom carrot salad dressed in grapefruit-lime vinaigrette doesn’t sound like your typical pub grub, it’s because Manito Tap House isn’t your typical pub. Credit atypical owner Patrick McPherson and his mercurial, mustachioed executive chef, Branden Moreau. That means from-scratch, seasonal menus with something for omnivores, carnivores, vegetarians, vegans and even diners with unique food concerns. Another goal for Moreau is featuring local products. “I am on a constant communicative basis with my purveyors and meet with them several times a week,” says Moreau, who sourced the carrots for this recipe from Spokane’s Main Market. Roasting the carrots heightens this humble veggie’s hidden sweetness, but isn’t the only cooking method Moreau would employ for this dish. “Consistency in cooking is key,” says Moreau, who is hot on the sous-vide cooking method. French for “under vacuum,” sous-vide involves sealing foods in specialized, airtight bags and immersing them in precision-heated water, sealing in juices. With their required Hazard Analysis & Critical Control Points (HACCP) plan now in place — just one of many food safety requirements chefs and restaurant owners have to be aware of — Moreau can begin experimenting with the technique in earnest. Persistence is just part of his nature, says Moreau, who remembers learning to cook an omelet as a 7- or 8-year-old. Inspired to cook by his grandmother, Moreau seized an opportunity to take a class at the NEWTECH Skill Center (formerly the Spokane Skill Center). “I just remember wanting more,” says Moreau, who worked at Longhorn Barbecue during his Mead High School years. Then he caught the attention of Mead alum Alexa Wilson, formerly of the Davenport Hotel and Wild Sage Bistro and currently corporate executive chef at food and beverage distributor Sysco. Wilson hired Moreau to work at Prospectors Bar and Grill, which he did until attending Western Culinary Institute’s Le Cordon Bleu in Portland. Culinary school brought sweet success for Moreau. In addition to meeting future wife Brittany there — she is Manito Tap House’s resident baker — Moreau also earned an internship at famed restaurateur Thomas Keller’s Las Vegas Bouchon Bistro inside the Venetian. Then it was off to Seattle, where Moreau became sous-chef at the venerable Place Pigalle in Pike Street Market. That’s where he won the 2011 Master of the Market “Iron Chef” cooking competition, impressing judges with not only his culinary skills, but also his impromptu yo-yo demonstration. An avid yo-yoist since 1996 — he was ranked fifth nationwide in 2000 — Moreau still mentors yo-yoists and judges competitions in his spare time but would rather be in the kitchen. Wash and trim the tops off the heirloom carrots. Blanch in a small pot of boiling water for about eight minutes. Remove blanched carrots and place in an ice bath to stop the cooking process. Remove from water and peel any loose skin from carrots. You want the carrots to be slightly cooked but not too soft. Combine cumin, crushed red pepper, brown sugar, salt, and black pepper in small mixing bowl. Whisk ¾ cup of canola oil into the spice mixture. Toss carrots in spice mixture; remove carrots, draining excess oil, and roast for 20 minutes at 400 degrees. Refrigerate carrots until ready for use. Combine citrus juices and slowly whisk in ½ cup of canola oil to create vinaigrette. Add a small pinch of salt and pepper if preferred. Toss arugula and spring mix in a small mixing bowl with citrus dressing. Add enough dressing to coat the lettuce to your liking — there will be some left over. Add sunflower seeds. Place dressed salad on a chilled plate, cut carrots diagonally and shingle onto bed of lettuce. Julienne the avocado and lay over the shingled carrots. Garnish with sesame seeds. Serves two as side salad, or one main-dish salad.